I’d like to show you this product recently launched in Spain . The lasting of the flavour in the chewing gum has always been one of the critical issues in the industry. 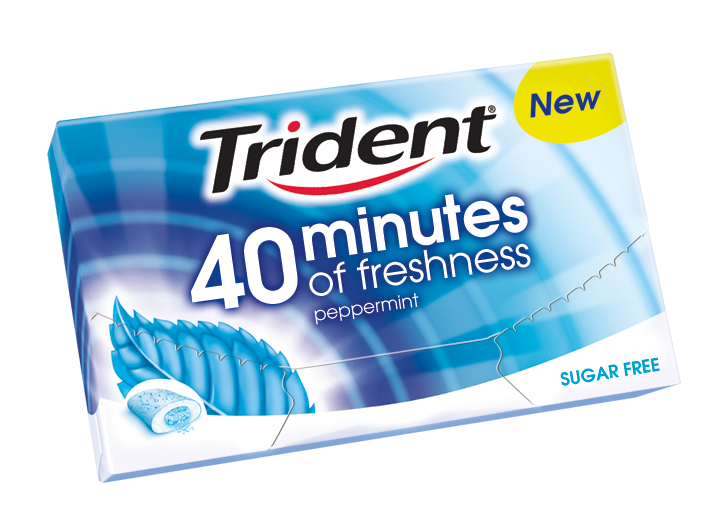 However, this is the first time that I see a chewing gum that mentions specifically a precise time of lastingness (freshness in this case). The same concept has been launched under the brands HOLLYWOOD and STIMOROL in other countries. I must admit that the promise is brave! The packaging is also interesting: A carton box with a sleeve that opens and the single units can be dosified through a hole. The units are coated chewing gums with a powdery layer outside and a district center. The whole product is full of coloured spots. For the time being I’ve found it with spearmint and with peppermint flavors. Each box contains 10 pieces. The launch has been supported by a strong marketing campaign including TV and facebook.